An illustration of the solar system to scale, created by the San Francisco-based artist Roberto Ziche. 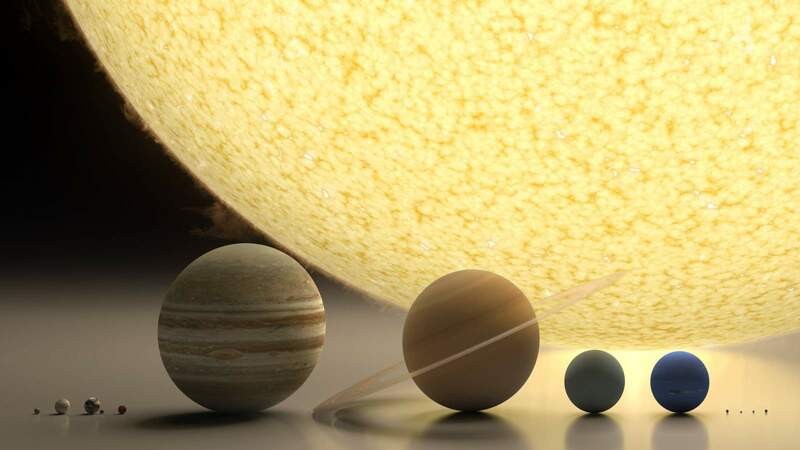 The image features the Sun in the background with the planets, Moon and the four dwarf planets lined up in the foreground in relative scale of size to one another. You can see the full-size image on Roberto Ziche’s website. “I found the images content to be extremely interesting, but the design and quality was definitely something that could have been improved”. Haumea: Originally designated 2003 EL61 (and nicknamed Santa by one discovery team), Haumea resides in the Kuiper belt, a region outside the orbit of Neptune. In other words, it is a trans-Neptunian object (TNO), like Pluto, Makemake, and Eris in the illustration above. It is one of the fastest rotating large objects in our solar system. Its fast spin distorts Haumea’s shape, making this dwarf planet look like a football. It was discovered in 2004 by a team headed by Mike Brown of Caltech (the Pluto-killer himself) at the Palomar Observatory in the United States and independently in 2005, by a team headed by José Luis Ortiz Moreno at the Sierra Nevada Observatory in Spain. Haumea was named after the Hawaiian goddess of fertility. Makemake: Along with fellow dwarf planets Pluto, Eris and Haumea, Makemake is also located in the Kuiper Belt. Slightly smaller than Pluto, Makemake is the second-brightest object in the Kuiper Belt as seen from Earth (while Pluto is the brightest). It takes about 305 Earth years for this dwarf planet to make one trip around the sun. Eris: Originally designated 2003 UB313 (and nicknamed for the television warrior Xena by its discovery team), it is one of the largest known dwarf planets in our solar system. It’s about the same size as Pluto, but is three times farther from the Sun. Eris first appeared to be larger than Pluto. This triggered a debate in the scientific community that led to the International Astronomical Union’s decision in 2006 to clarify the definition of a planet. Pluto, Eris, and other similar objects are now classified as dwarf planets. Observations of a stellar occultation by Eris in 2010, showed that its diameter was 2,326 ± 12 kilometers (1,445.3 ± 7.5 mi), very slightly less than Pluto, which was measured by New Horizons as 2,372 ± 4 kilometers (1,473.9 ± 2.5 mi) in July 2015. Eris is named for the ancient Greek goddess of discord and strife.